Sunday nights have suddenly gotten very crowded with both Downton Abbey and Once Upon a Time on the very same night. At least they are on at different times. Anyway, my usual Once post was derailed by my need to watch the two-hour premiere of Downton. And I simply couldn't write a post about Once after watching Downton. Now that I have had a few days to ruminate, I find that I must write about them both at the same time. 1) True love - It reunites and saves Mary Margaret and David and it reunites Lady Mary Crawley and Matthew Crawley and save Downton Abbey from being entailed away (yes, yes, I know there are other issues). 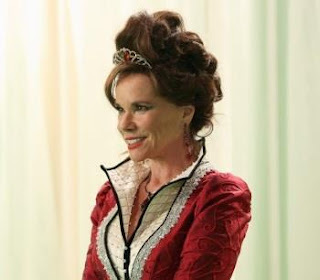 2) Cora v. Cora - Each show has a Cora. Each show has a Mary. The Cora's are very different. Once Cora is evil incarnate. Downton Cora is rather meek compared to the other strong women in her family, although her one biggest moment of stength was to protect her daughter's reputation. If we had a death match between these two, Once Cora wins no problem, however I prefer to watch Downton Cora. 3) Mary v. Mary - The Mary's are more similar - Mary Margaret (Snow White) is a strong Princess who won't take her prince on any old terms. 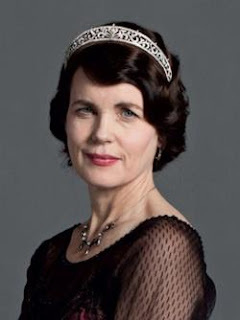 Lady Mary Grantham is a strong aristocrat who won't take her Prince on any old terms either. 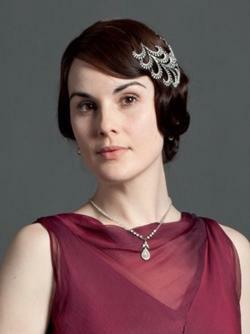 Mary Margaret possess more skill in battle, but Lady Mary fights with words and actions. Both consider family to be the most important thing in the world. 3) Grandmothers are dominant - no one can say that Cora from Once isn't in control and the same can be said most of the time for the Dowager Countess and Martha Levinson. These are three of the strongest, most opinionated women on television. I might add that they are all played by brilliant actresses - Barbara Hershey, Maggie Smith and Shirley MacLaine. 4) Title and position matter - On Once Upon a Time, Queens, Kings and Princes abound - Regina, Cora and David come to mind. On Downton, duty always calls as the Grantham's try to maintain the dignity of an old system in a changing world. 5) Stunning wardrobes - Even if both these shows were horrible (which they never are), I could just spend my time starring at the beautiful clothes. Lady Mary's red dress the night before the wedding was fabulous as was The Evil Queen's dress when she was back talking to Hook in the episode before this one. Just amazing wardrobe work. 6) A World That Doesn't Exist - Both shows are set in a world that doesn't exist. Downton is mired in the past and Once is mired in myth. It's fun to hang out somewhere that isn't so much like our world today. I do love both shows and am so glad Sunday nights are so entertaining. If you are looking for recaps, there's a great story here on this week's episode of Once Upon a Time where the shows producers explain why the cricket switch was necessary. In general, I hope we see more Hook next week, and according to the previews, we will. You know how I love Hook. I loved the addition of Pongo. Really great cast add. There is a great Downton recap here. This episode was perfect and I didn't want it to end. I do hope that Lord Grantham can find the dosh to save Downton somewhere. Don't you? I watched both of these, too, especially because my SiL and niece (who I turned onto Once last year) were in town. One Downton question: Didn't the quick cut from the altar conversation to the motoring back from the honeymoon leave you feeling a little ripped off? No ceremony, but worse, no reception! We really wanted to hear the dialog during that! Anyway, I know the 2 hour special was 2 episodes jammed together, but really, it was a pretty anticipated event, and viewers got to luxuriate in it NOT AT ALL before we were back to everyday. @Clare2e - I guess I didn't miss the reception. It is such an overdone scene in my mind - wedding reception after wedding reception, in movie after movie, tv show after tv show. I was a wee bit glad that they skipped it. And I felt like Mary and Matthew finally got the honeymoon they deserved. I was perfectly happy during the two hour opening and didn't want it to end. I did feel like fast forwarded through the jail scenes, but I chalked that up to me feeling uncomfortable about Bates position.